I recently mixed up my Z Palette and decided to take out some shades and replace with other shades. I am so happy with my palette as I can create so many looks. 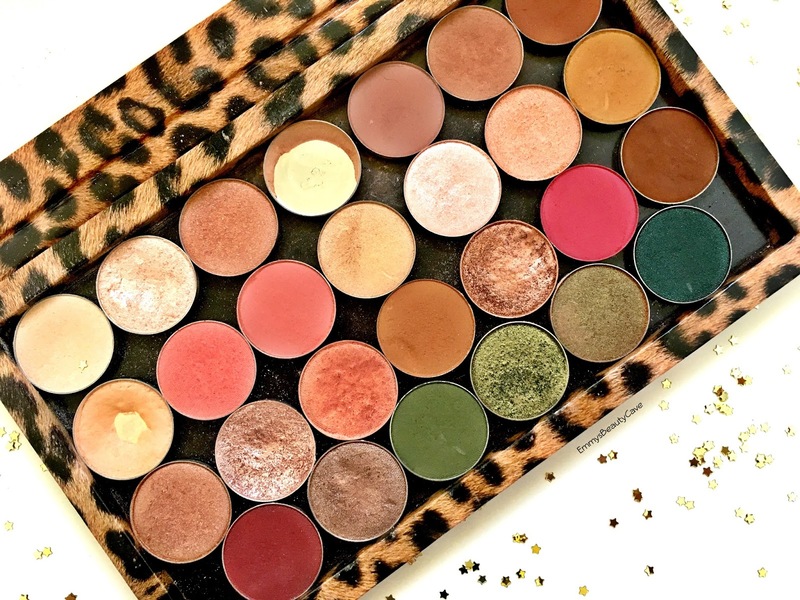 My palette includes Makeup Geek, ColourPop and Anastasia Beverly Hills Eye Shadows. I thought I would do an updated post and include swatches of every shade for you. Makeup Geek Vanilla Bean - Matte pale cream shade. Perfect as a base. Makeup Geek Shimma Shimma - Shimmer shade which I mainly use on my brow bone and as a inner corner highlight. Anastasia Beverly Hills Party Dress - Shimmer light brown with flecks of gold. Such a pretty shade for all over the lid. Makeup Geek Purely Naked - Matte light brown, I use this for every look as a transition shade or for a no makeup makeup day I use it all over the lid on it's own. As you can see I have well and truly hit pan. ColourPop Made To Last - This is more of a cool toned brown, in person it has a more cool, grey undertone. 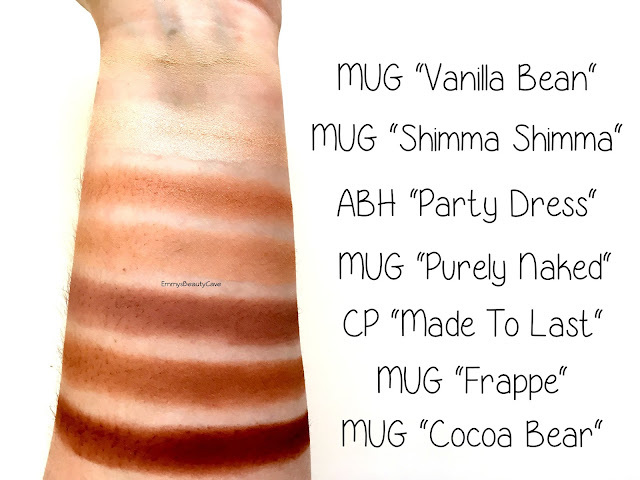 Makeup Geek Frappe - A warmer version of Purely Naked, I use this as a crease shade. Makeup Geek Cocoa Bear - A Deep brown with a red undertone. Perfect for darkening up the outer corner. Makeup Geek Beaches & Cream - Matte very similar to Vanilla Bean but it has a more peachy/yellow undertone. Again perfect as a base or transition shade. Makeup Geek Mango Tango - A warm bright matte pinky shade, works well with peachy looks. 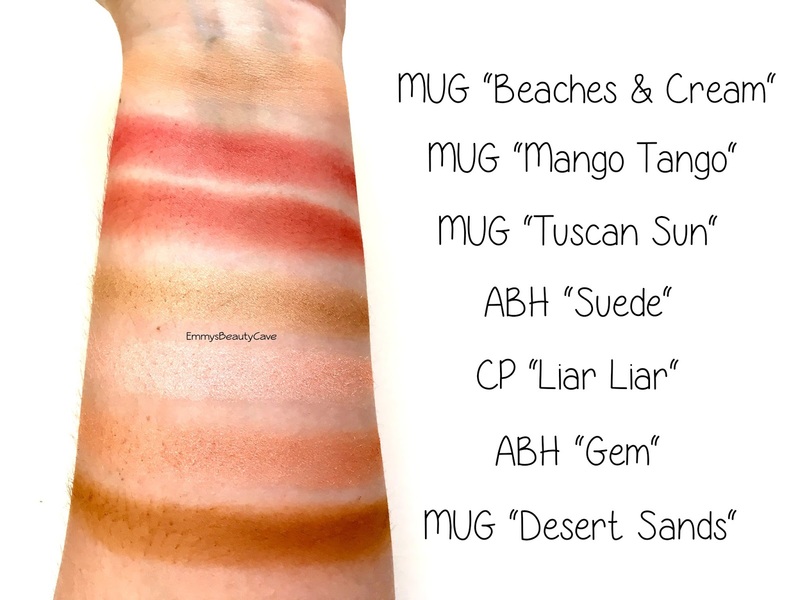 Makeup Geek Tuscan Sun - Matte and similar to Mango Tango. This is more of a terracotta pinky shade whereas Mango Tango is brighter. Anastasia Beverly Hills Suede - A light gold in a Satin Finish. I wanted a gold that wasn't too yellow and this one works well all over the lid or as a halo eye. ColourPop Liar Liar - A pale pink shimmer. This looks super cute all over the lid. Anastasia Beverly Hills Gem - A Peachy Champagne in a Satin Finish. I am obsessed with this all over my lid paired with Beaches & Cream and Frappe. Makeup Geek Desert Sands - One of my favourite shades. It is a deep mustard shade and it is matte. I love applying it in my crease. Anastasia Beverly Hills Glisten - A shimmery deep gold/beige. Very pretty all over the lid. Makeup Geek Starry Eyed - A foiled shadow, intensely pigmented. It is a pinky champagne. I use all over my lid or sometimes as a cheekbone highlight. Makeup Geek Cosmopolitan - A Peachy Shimmer. Works well with Mango Tango and Tuscan Sun. Anastasia Beverly Hills Caramel - Matte warm brown. Looks gorgeous in the crease or all over the lid. 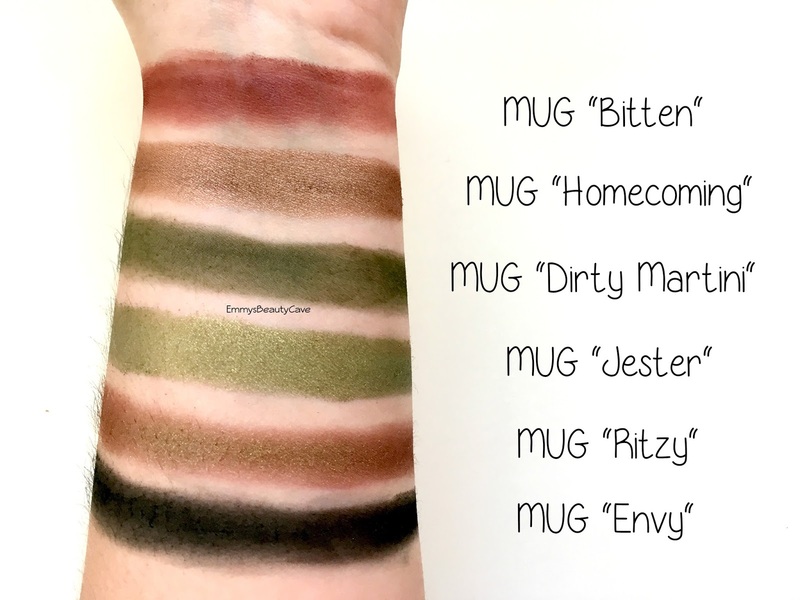 Makeup Geek Grandstand - Another foiled shadow. A deep copper, looks alot more intense in person. ColourPop Stay Golden - Matte Pinky Red. This is such an intense shade that looks gorgeous on the outer v or all over the lid. Anastasia Beverly Hills Fudge - Matte chocolate brown. I don't like to use black eye shadow so this is perfect for the outer corners to deepen them. Makeup Geek Bitten - A deep purple with a red/berry undertone. Makeup Geek Homecoming - A shimmery bronze. Perfect for all over the lid. Makeup Geek Dirty Martini - Another one of my favourites. This is matte khaki shade. I am obsessed with khaki lately. Makeup Geek Jester - My last foiled shadow. This all over the lid paired with Dirty Martini is stunning. Makeup Geek Ritzy - Duo Chrome, in some lights it shines bronze and in others it has a green tint. Makeup Geek Envy - A matte very dark green. Perfect for the outer corner. As you can see I like my warm shadows, cool tones really don't suit me. I love experimenting with Greens and Peaches lately so of course I have a row for each. 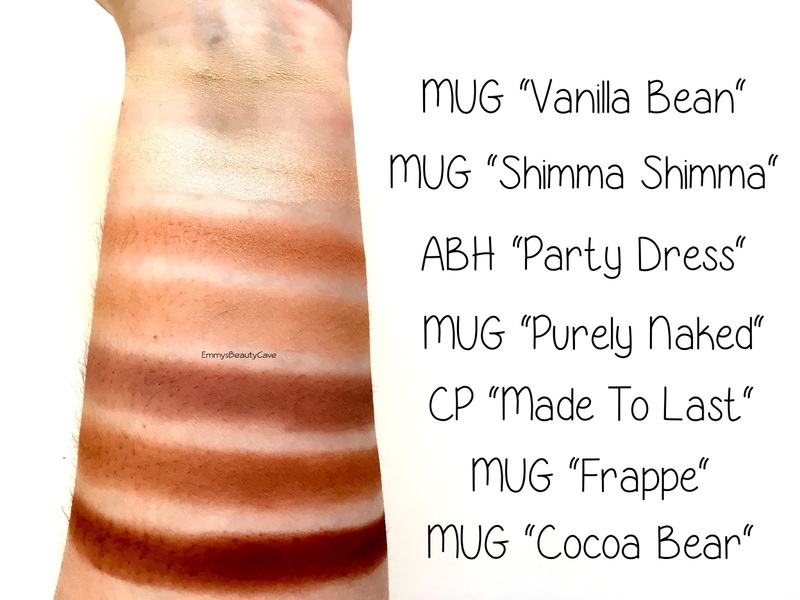 All three brands are very pigmented. The ColourPop ones do have more fallout but I don't mind that. 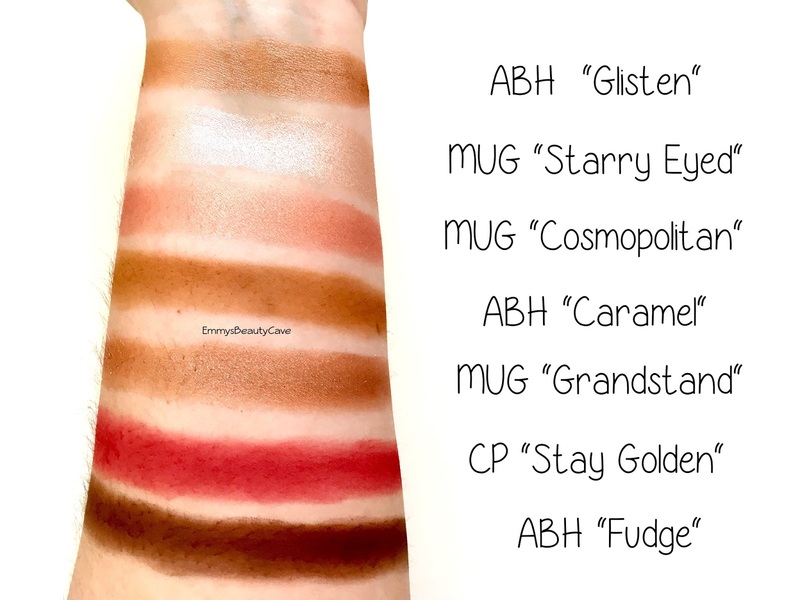 After reading Mammafulzo's Makeup Geek Eye Shadows Post it has definitely made me need Bake Sale & Taupe Notch! Products I've Hit Pan On.. Will I Re Purchase?